Headline: Anti-Kavanaugh protest postponed ‘in recognition of Indigenous People’s Day. An anti-Justice Brett Kavanaugh protest at Scripps College in California was postponed after student organizers realized the event was scheduled on Columbus Day or "Indigenous People's Day." “We want to deeply apologize for scheduling this event on the same day as the 2nd annual Indigenous People’s Day," student organizers wrote. "Monday is a day for indigenous and non-indigenous allies to stand in solidarity and acknowledge the genocidal mission system that enslaved and killed 80 [percent] of Natives living on this land. Additionally, we stand in solidarity with the 5,100 missing and murdered indigenous people." This is comical but it's also scary as hell. Because here you have these crazy leftists attacking Kavanaugh but guess what...they're deathly afraid of crazy leftists. Because they know in their hearts that anyone who gets in the way of leftism is just a speed bump on the road to utopia. In short, they're not in control of this hate missile. They don't know where it's going either. 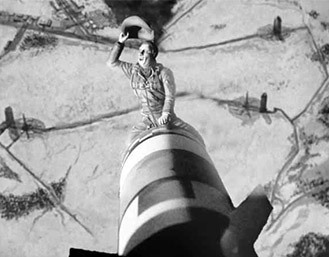 But like Slim Pickens they're content to ride it all the way down.